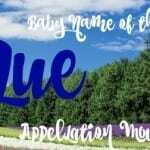 Take Indigo and Beyonce’s baby Blue, add in Sky, and you’ll arrive at this unexpected appellation. 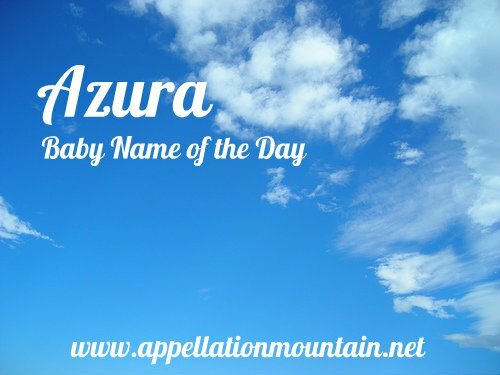 Thanks to Chloe-Marie for suggesting Azura as our Baby Name of the Day. Azura brings to mind the color blue, but this is no straightforward color name. Let’s begin with Azure, the color of the sky on a clear summer’s day. 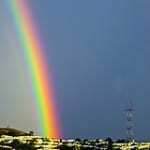 That sounds poetic, but it is based on the technical definition from the modern color wheel. Azure was once the French word for blue; today, bleu is commonly used. But azure persists in heraldry, where the shade is associated with sapphires and the planet Jupiter. The Old French word comes from the gemstone lapis lazuli. As sometimes happened with imports to French, the letter l was interpreted as an article: l’azuli. The l was dropped, and azuli became azur. Confused? For more on the whisper-down-the-alley quality of this name, check out the post on Lazuli. But before we declare Azura an elaboration of azure and thus a modern(ish) innovation, there’s a catch. There’s a non-canonical book of the Bible call the Book of Jubilees. Non-canonical books are an interesting thing. 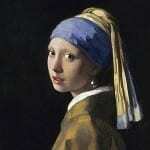 They’re not forgeries, and their exact provenance varies. Jubilees is among the many written by Jewish religious scholars in the early Christian era. It isn’t accepted as part of the Bible by most Christians, but it has been widely read over the course of history. 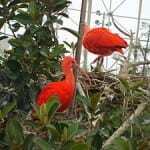 Much of Jubilees is about the same events as the Book of Genesis, but there’s also more detail on the descendants of Adam and Eve. They tell us that Cain and Abel had a younger brother named Seth, and Seth married his sister, Azura. There’s no origin I can find for Azura’s name. Given the origins of azure, it seems unlikely that the word was in use for the color blue when Jubilees was written. 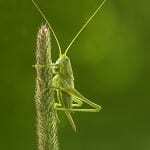 It is generally dated to 100 BC, if not earlier. Back to our era. Besides lapis lazuli, there’s a second gemstone connection. Azurite is a mineral related to copper. It’s a clear blue color, and has been known since ancient days, but azurite takes its name from azure. Whether it is the Bible, the gemstone, or the color, Azura has been in sparing use since the 1970s, and has gained steadily in the twenty-first century. 16 girls received the name in 2011, up from 8 in 1999. Then there’s Azura Skye, born Azura Storozynski. The actress got her unusual first name thanks to the gemstone azurite. She’s been acting since the late 1990s, with a few notable roles. It might explain the uptick in girls given the name. A handful of fictional characters have also answered to Azura, including in Marvel Comics and, in The Elder Scrolls video game, she’s a princess of dusk and dawn. All of it makes this not-quite-color name a surprising possibility for a daughter. She’s rare, but those quasi-Biblical roots ground her. And while she’s more common in 2013 than she was in the past, Azura remains an appealing rarity. I really love Azura. It’s one of the names that has been a front-runner on my list for a few years (which is rare, I change my mind often). I can’t remember where I first heard it. I like Azure (for a girl), but it feels unfinished to me. Azura feels like many names that are trendy right now – especially with the z, but is so rare! Do you think it reminds people of Acura though (the vehicle)? I never would have thought of Acura, especially since I don’t pronounce the /u/ the same way in the two of those. I think this name is rather cool. I met a real Azure finally, last year. No Azuras yet though. I did watch a film and I thought the character’s name was Azura, but maybe it was the actress you’re referring to. I’m curious about this name Izora mentioned above. I also wondered if the Hebrew Azura could be at all related to Asshur? Unlikely — A(s)shur is spelled with aleph.shin [אשׁ], not ayin.zayin [עז] as in Azur/a. Do you remember when you do did a name of the day on Izora a hundred years ago – or last year maybe? For some reason I always wondered if Izora was a pioneer-spirit sort of enthusiasm over authenticity spelling of Azura. Unless Azura was in use somewhere out there and I’m missing it? There were a very few women by the name in the nineteenth century. My instinct would be to attribute the use to the Biblical figure … but maybe not. Not a huge fan of Azura. However I quite like Azure for a boy. The Hebrew Azura is a feminine form of Azur/Azzur/Azor [עזורה, ayin.zayin.vav.resh.hey] meaning “help/er”. You could also form Azura from az (strong), and ur (light). To clarify, that Hebrew spelling is for Azura — Azur is [עזור, ayin.zayin.vav.resh]. Thanks, Panya! I really appreciate it.